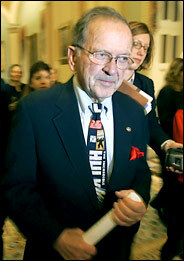 Former United States Senator Ted Stevens was killed in a plane crash in southwestern Alaska on Monday night. Five of the nine people on board the small plane headed to a remote fishing lodge were killed in the crash, Gov. Sean Parnell of Alaska said. Mr. Stevens, who had been the longest-serving Republican in the United States Senate while representing Alaska, was 86. Sean O’Keefe, 54, a former NASA administrator who now is an executive with the European aerospace firm EADS, was also on the plane with his son, but they both survived, according to an official briefed on the crash who spoke on the condition of anonymity because the investigation was ongoing. Mr. O’Keefe, the official said, was “badly injured,” and was among three passengers airlifted to an Anchorage hospital. The body of Mr. Stevens was found just after daylight, according to a former aide to Mr. Stevens who spoke on the condition of anonymity out of respect to the family. Stevens represented the state for seven terms in the U.S. Senate and was revered as a patriarch of Alaska politics; he nearly won reelection in 2008 despite a federal corruption trial that unfolded during the campaign but was defeated by Democrat Mark Begich. The downed plane was owned by IT corporation CGI. Ted Stevens never worried much about making friends in Washington. “I’m a mean, miserable S.O.B.,” he once declared. He wasn’t speaking with contrition; he was bragging. Stevens was a tough character—brusque, short-tempered, and even vindictive. To underscore the point, he sometimes wore an Incredible Hulk necktie when he fought battles on the Senate floor. Those may not sound like winning qualities in a politician, but Stevens—who was killed in a plane crash in southwestern Alaska last night— harnessed them in the service of an epic, combative, and ultimately severely tarnished political career. In the home stretch of a Senate career that began in 1968, Stevens was a titan in both Washington and Alaska. Over four decades he emerged as part of an old guard of power brokers who mastered the Senate’s arcane rules and gathered enormous institutional power. At the peak of his influence, Stevens chaired the Senate Appropriations Committee in the Republican Senate that reigned for most of the Bush years, making him one of the most powerful men in Washington. The Bridge to Nowhere champion, who lost his 2008 re-election bid after being convicted of lying to conceal gifts he was legally required to report, won a post-defeat victory five months later, when the Justice Department withdrew the charges against him, effectively nullifying his convictions, because of prosecutorial misconduct. As I argued after his indictment, Stevens’ real crime was his record of “service” to the people of Alaska, which in any other context would be recognized as theft on a grand scale. 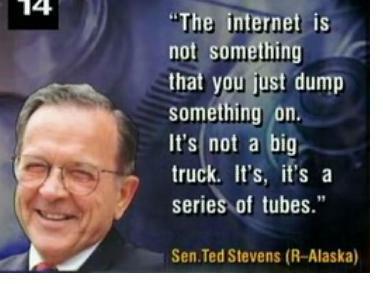 But around the Internet, Stevens is best known for the meme he helped create: “series of tubes .” I note that the timing of Stevens’ plane crash is odd because that phrase Stevens coined was done so in the context of net neutrality — a subject which is obviously very much in the news today due to the Google/Verizon dealings. Stevens was actually the Chairman of the Senate Commerce Committee which was debating the issue in 2006. At that time, he gave an 11 minute speech about the topic that compared the Internet to a “series of tubes.” The rest is history. […] They want to deliver vast amounts of information over the Internet. And again, the Internet is not something that you just dump something on. It’s not a big truck. It’s a series of tubes. And if you don’t understand, those tubes can be filled and if they are filled, when you put your message in, it gets in line and it’s going to be delayed by anyone that puts into that tube enormous amounts of material, enormous amounts of material. Soon we had dance remixes on YouTube, and it became a go-to gag for Jon Stewart on the Daily Show . Incidentally, Google has even poked fun at the statement a few times — notably, an older version of the Chrome web browser would launch a tubes screen saver or a gray page stating “The Tubes are Clogged” if you entered “about: internets” into the address bar. “Ted Stevens” is currently the top Trending Topic on Twitter, with about half the tweets noting his “series of tubes” comment. The meme will go on. Our deepest sympathies go out to Stevens’ family in this difficult time. Hopefully they understand that the Internet had a soft spot for the Senator, despite his stance on net neutrality — even Google and Verizon seem to have a hard time understanding it, judging from their actions the past few days.